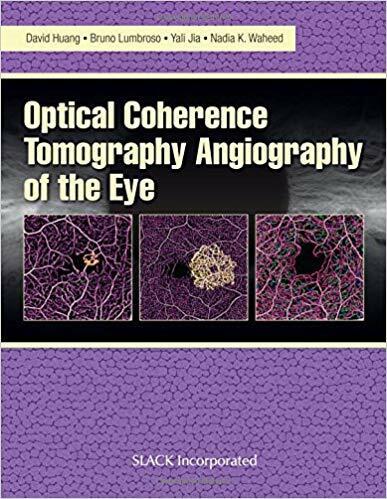 Optical coherence tomography (OCT) angiography is an important new imaging modality that is already being used by ophthalmologists in retina centers worldwide. It uses motion as intrinsic contrast, thus obviating the need to inject any intravenous dye. It uses infrared light that is invisible to the patient, and only requires few seconds per scan. This makes it both easier to use and much better tolerated by patients than traditional dye-based fluorescein angiography (FA) and indocyanine green (ICG) angiography. 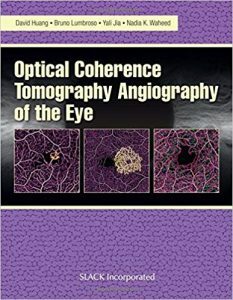 Inside Optical Coherence Tomography Angiography of the Eye Drs. David Huang, Bruno Lumbroso, Yali Jia, and Nadia Waheed include detailed information on clinical applications and fundamental principles needed to understand and use this new technology. This includes information on high-speed OCT systems, algorithms to extract flow contrast, the appearance of the normal eye, the findings in myriad diseases, and tips on how to deal with artifact and pitfalls. The 3-dimensional nature of OCT angiography provides visualization that was not possible before with either FA or ICG and readers will come to appreciate how this enables the visualization of previously difficult to image vascular beds such as the 4 retinal vascular plexuses (radial peripapillary, superficial, intermediate, and deep), the choriocapillaris, and the deeper choroidal vessels. Given its noninvasive nature and ease of use, OCT angiography imaging is rapidly taking an important place in everyday ophthalmology and may soon replace fluorescein angiography in everyday practice. David Huang, MD, PhD is the Peterson Professor of Ophthalmology and Professor of Biomedical Engineering at the Oregon Health & Science University (Portland, Oregon). Dr. Huang received an MD from Harvard University (Cambridge, Massachusetts) and a PhD from Massachusetts Institute of Technology (Cambridge, Massachusetts). He completed an ophthalmology residency at the Doheny Eye Institute/University of Southern California (Los Angeles, California) and cornea fellowship at Emory University (Atlanta, Georgia). Dr. Huang is a co-inventor of optical coherence tomography (OCT), which is the most commonly used ophthalmic imaging technology at 30 million procedures per year. More recently he has pioneered anterior segment OCT and OCT angiography. His seminal article on OCT, published in Science in 1991, has been cited more than 11,000 times. He has 19 issued patents and 18 pending patents in the areas of OCT, mobile health testing, tissue engineering and corneal laser surgery. He has been the principal investigator of 5 NIH research grants totaling over $20 million. He has published more than 200 peer-reviewed articles with nearly 40,000 citations. He has edited 8 books. Dr. Huang has received the Champalimaud Vision Award, the Jonas Friedenwald Award, the David Epstein Award from the Association for Research in Vision & Ophthalmology, the Senior Achievement Award from the American Academy of Ophthalmology, and the Fritz & Dolores Russ Award from the National Academy of Engineering (USA). He is a fellow of the American Academy of Inventors and American Ophthalmological Society. Dr. Huang leads the Center for Ophthalmic Optics and Lasers (www.COOLLab.net). He is a founder of Gobiquity Mobile Health, Inc. (www.gobiquity.com), a maker of mobile diagnostic apps.